Schizophrenia is а severe mental disorder which usually begins in adolescence and often has a chronic deteriorating course. Despite of more than a hundred years of studying, schizophrenia still is one of the most challenging problems in psychiatry. Social and economic burden related to schizophrenia is tremendous . There is no full understanding of underlying processes and causal mechanisms of this disorder. 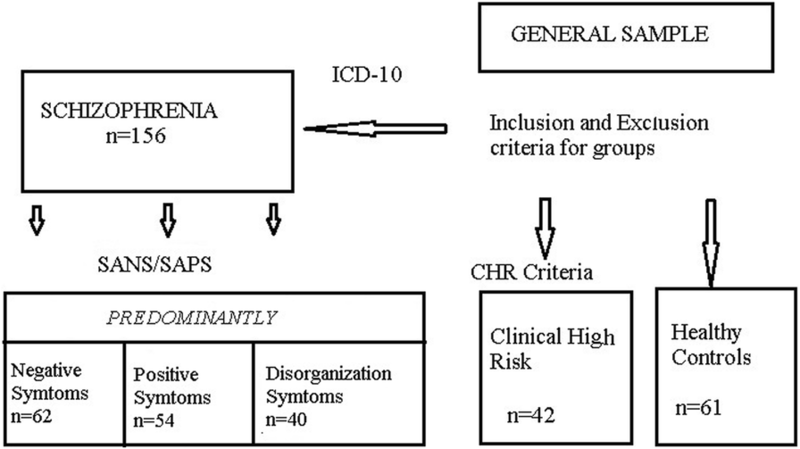 Diagnosis of schizophrenia is based on the detection of clinical symptoms and depends on the clinician’s interpretation of patients’ subjective experience . Researchers are trying to find more objective tests (biomarkers) to detect schizophrenia, to make a prognosis, to predict response to treatment. [3–6]. Some potential biomarkers for schizophrenia have been proposed, such as markers associated with inflammation, immune processes and with metabolic disorders or neuroendocrine/neurotrophin/ neurotransmitter alterations [5–7], as well as abnormalities in neural activity [5, 8]. Some previous schizophrenia studies have found that there are no identifiable deviations in the velocity, latency to initiation, and amplitude of reflexive saccades in schizophrenia patients regardless of medication status and chronicity as elicited by regular visually guided saccade paradigms [17–19]. However, the conclusion of normal reflexive saccade parameters has been questioned by some authors [20, 21]. 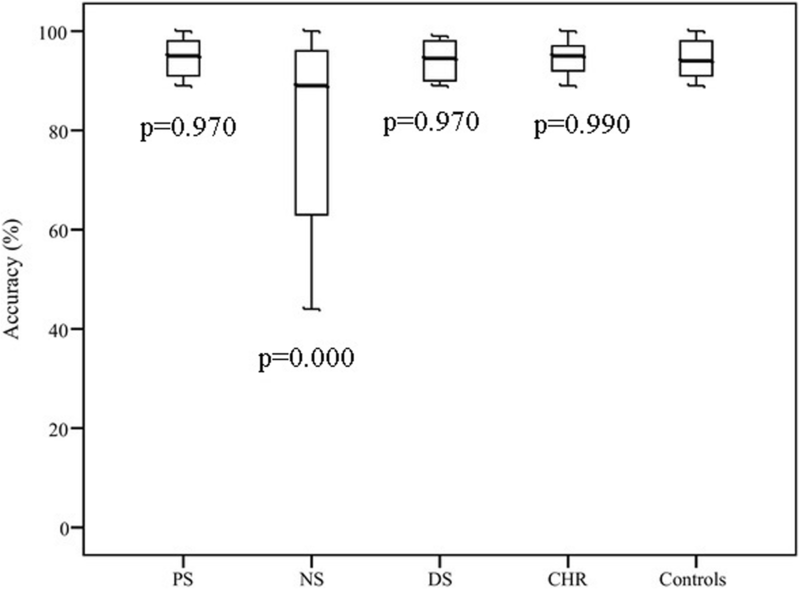 Impaired performance in the predictive saccades test has previously been reported in schizophrenia patients [22, 23]. Antisaccade tasks are commonly used to explore inhibitory control, and poor inhibition has been linked with poor impulse control, agitation, excitement and hostility, as well as impairment in the dorsolateral prefrontal cortex [24, 25]. The antisaccade task generates the most frequently observed volitional-saccade abnormality in schizophrenia . Increased rate of errors in saccadic task is one of the most replicable findings in schizophrenia research . The study rationale has two important aspects. The first one is the dimensional approach, which proposed the independence of several psychopathological dimensions that differently relate to structural and functional systems of the brain, to the prognosis and to the treatment response [27–30]. Three-factor model of schizophrenia has been proposed by Liddle P.F. (1987) and includes factors of 1) negative symptoms (‘psychomotor poverty’), 2) positive symptoms (‘reality distortion’) and 3) thought-and-speech disorder factor (‘disorganisation’) [27–30]. To our knowledge, only one eye movement research has been conducted in relation to schizophrenic symptoms using the dimensional model , which revealed specific patterns of smooth pursuit abnormalities in disorganization syndrome. 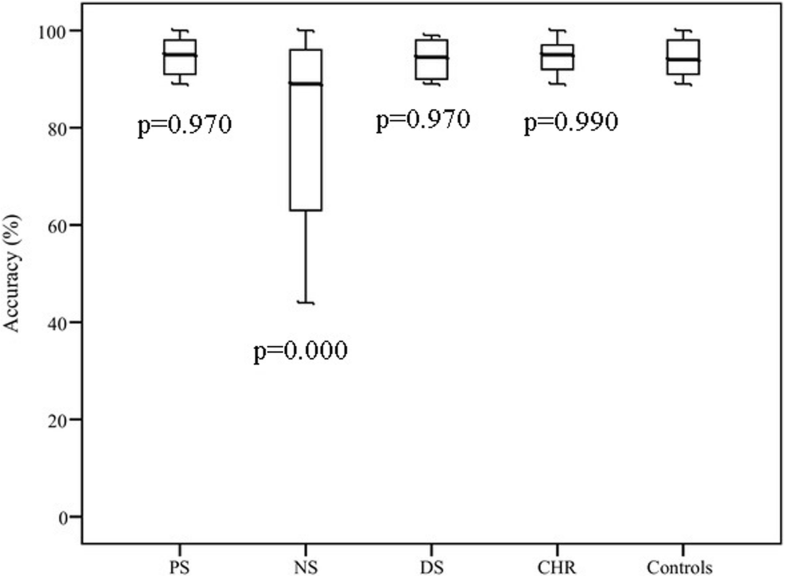 The results of this study support our initial hypothesis that the main syndromes of schizophrenia are accompanied by specific patterns of saccadic abnormalities. 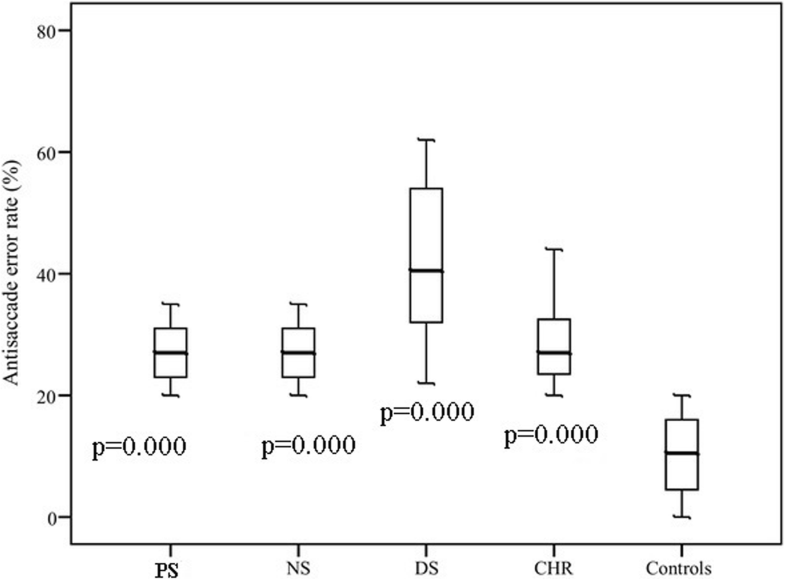 Oculomotor parameters of NS were different from the other groups of patients. Latencies of predictive and reflexive saccades were significantly longer than in controls only in the NS group. The accuracy of predictive saccades was also different from controls only in the NS schizophrenia group. Our results are consistent with those of other researchers who found motor, cognitive and neuropathological differences in patients with prominent negative symptoms when compared to patients who do not have prominent negative symptoms [43–45]. The neural basis for negative symptoms (apathy, poverty of speech, emotional blunting, avolition etc.) is the cortico-striato-thalamo-cortical circuit dysfunction including predominantly prefrontal cortex dysfunction [46–48]. The dorsolateral prefrontal cortex (DLPFC) is known for its involvement in executive functions (such as working memory, cognitive flexibility, planning, inhibition and etc.) [49–51] deterioration of which is the primary feature of schizophrenia. The DLPFC is involved in ocular motor behavior, i.e. saccadic eye movements, especially intentional saccades [52–55]. As it has been mentioned by Pierrot-Deseilligny et al. , DLPFC is located at a strategic place between the attentional (posterior cingulate cortex) and motivational (anterior cingulate cortex) areas, the executive cortical (frontal eye field and supplementary eye field) and brainstem (superior colliculus) ocular motor areas. Wide involvement of the prefrontal cortex in pathological processes in NS patients may result in saccadic movement abnormalities even in a simple task. 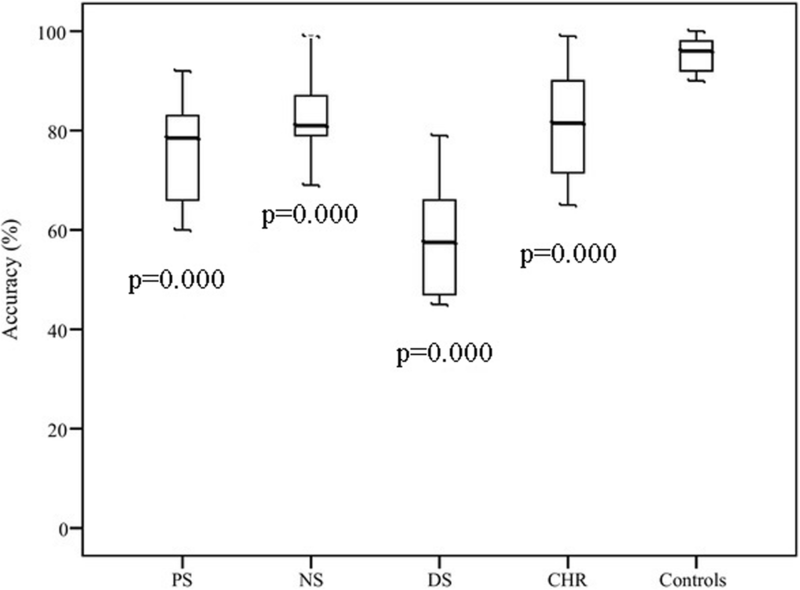 CHR group differs from controls in accuracy of reflexive saccades and antisaccades. Only several studies have investigated performance on saccadic tasks in clinical high risk populations. By contrast to Caldini study , we found that the error rate in antisaccade task was significantly higher in CHR compared to controls. The performance on antisaccade task in CHR was close to the one of schizophrenia patients. So, our results support that eye movement alterations are possible markers of clinical high risk of psychosis. It may be the result of dorsolateral prefrontal cortex dysfunction. Several studies have reported cognitive impairment in CHR subjects [61–64], which is predominantly focused on executive functions and working memory. These cognitive functions and voluntary saccades performance are associated with DLPFC. Abnormal antisaccade task performance is present at the early stages of schizophrenia and reflects working memory and inhibitory control disturbances. Taking into account the fact that CHR group participants did not receive antipsychotic treatment, we can propose that the eye movement alterations are present at the early stages of schizophrenia and do not depend on treatment. Although in order to prove that the assessment of antipsychotic-naïve patients with schizophrenia is needed. Accuracy of eye movements is controlled by a ‘brain error detector’, which is localized predominantly in anterior cingulate cortex, eye fields of the frontal and supplementary motor cortex areas . The brain error detector can detect and correct signals from proprioreceptors of external eye muscles, from photoreceptors of the retina and efferent copy signals. The worse performance on the saccade task in schizophrenia patients compared to controls may be explained by the brain error detector failure or by the corollary discharge (CD) dysfunction, a mechanism for distinguishing self-generated percepts from externally generated percepts [66–68]. The main idea of CD in eye movements is that the brain informs and modulates the activity of sensory processing systems of eye position via an efference copy of motor command, CD signal allows frontal eye field to update receptive field to the new target location before the execution of a saccade . CD failure results in deficits of self-monitoring and inability of schizophrenia patients to accurately attribute sensory stimulus as internally- or externally-generated. Hallucinations and delusions are closely associated with CD dysfunction.